Kiosk and Interlock are iLab modules used to track real time usage on instruments for more accurate billing and reporting purposes. Kiosk is a stand alone tracking station used to capture logged time. 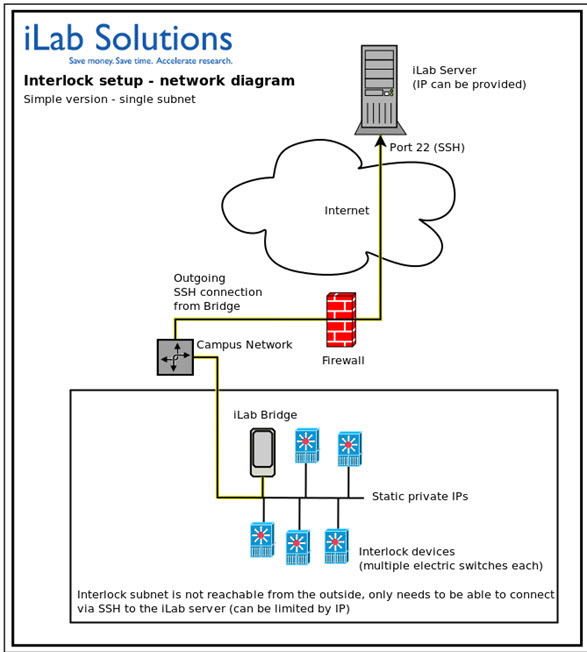 Interlock is a device utilizing hardware or software to control power to equipment through a secure iLab Bridge. Kiosk can be used without Interlock to simply track the usage on equipment within the core. The Kiosk is a stand alone station providing users a login interface to begin and end their reservation. Please refer to the Managing Kiosk‍ article for more information. Once an agreement is in place, the iLab engineering team will configure and send you an iLab bridge. Your interlock devices will be connected to this bridge, and will require a static IP. The bridge will then initiate a secure local connection to our iLab servers from within your organization. The bridge and the subnet do not need to be visible to the outside - they only need to be able to SSH out to the iLab server. Software Interlock controls user access to an instrument's specific software programs, governed by a combination of iLab’s Scheduling and Calendar functionality, the iLab Equipment Kiosk interface, and a third-party software access solution. The iLab Software Interlock requires that the customer purchase from Sassafras a K2-KeyServer server license as well as individual seats for each piece of equipment. Please refer to the Managing Interlock‍ article for more information. The Hardware Interlock approach relies on controlling the power to key components, typically the monitor used by a piece of equipment. iLab supports two types of network-enabled interlock devices: Synaccess and ADAM 6000. The iLab software interface communicates with these devices in three ways: turning a channel on, turning a channel off, or checking the status of a particular channel. Synaccess series: The Synaccess series of devices provides the simplicity of controlling a number (2,10 or 16) regular 110V outlets that can be hooked up with different hardware aspects of the equipment in question, such as a computer monitor. The configuration can be as simple as connecting the device to the network and power, plugging in the device to be controlled and setting the username and password along with the static IP address for that device. ADAM 6000 series: The Adam 6060 is an industrial-grade device that has 6 dry electric switches that can control DC current of up to 30V. This gives the added flexibility of controlling more sensitive equipment and engaging interlocks on the equipment without shutting off the main power supply. The installation of these interlocks is, of course, more involved, and implies the help of an electrical engineer or similar within the facility. In order to be able to take full advantage of the product, some coordination will be required with IT on-site. 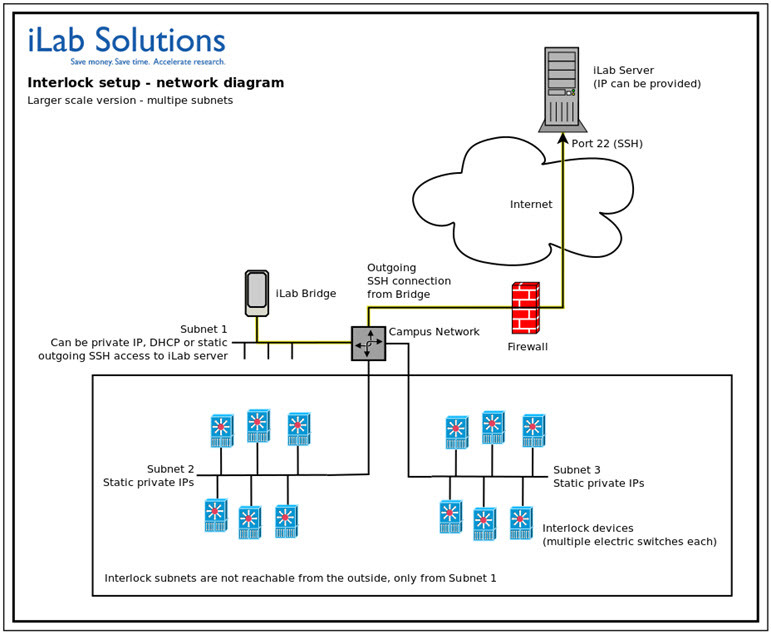 An IT team on-site will need to create a secure local network to which the iLab bridge and any of the interlock devices will be connected. Each device on the network will require a static IP. The subnet does not need to be visible from the outside - the iLab bridge needs only to be able to connect to the iLab server via an SSH connection. Please refer to the Managing Interlock‍ article for more information.